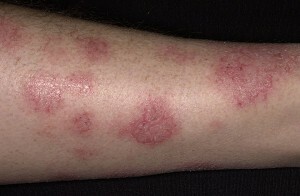 Eczema is a term that refers to a very itchy, red, scaly or flaky eruption. There are many types, including those caused by contact with a substance that irritates the skin, or the more common “atopic dermatitis”. When we talk about atopic dermatitis, we are referring to the type of eczema that usually starts in childhood as itchy patches of skin. Patients with this type of eczema are at higher risk for hay fever and asthma as well, and there are often both genetic and environmental factors playing a causative role. Many, but not all, children improve as they grow, and some outgrow their eczema all together. Until this occurs, treatment is often necessary so that children are not itchy, and their quality of life not impacted by their skin disease. Treatment of eczema includes addressing the bathing and skin hydration tendencies of the patient, as well as deceasing the inflammation in the skin using various preparations such as steroid or non-steroidal creams. When eczema becomes very severe, sometimes therapy must be taken by mouth for a certain period of time. Your doctor will assess your eczema and teach you how to take care of the mild areas as well as the more severe ones, and how to manage flares. It is important for patients and parents to understand that there is no cure for eczema, and it is generally an ongoing condition that has good days and bad days. We can, however, minimize flares and manage the symptoms so that patients are minimally troubled by their skin disease.